When you are lagging behind in your mortgage payments the likelihood of losing your property would be frightening. There would be financial emergencies including loss of job etc. If you are struggling with your mortgage payment then you should reach your loan servicer to talk about the available options. This you should do as early as possible. You should keep in mind that the longer you take this step the lesser alternatives you have. Your request may have been rejected earlier but it’s wise to call your servicer even in this context. Servicers may be very busy but carry out perseverance in waiting for your servicer. There are some qualifications including your qualification for HAMP, your property is your primary home etc. before reaching your servicer. After contacting your servicer you should give some documentation. This will include your monthly mortgage payment, your latest income tax return etc. You can visit the appropriate websites to get relevant information regarding these. There are in fact several options when you can’t afford your mortgage anymore and some of them you can do by yourself. However, if there are some questions that need to be answered about mortgage concerns you can obtain knowledge from U.S. Department of Housing and Urban Development. An attorney can also be consulted in this scenario. 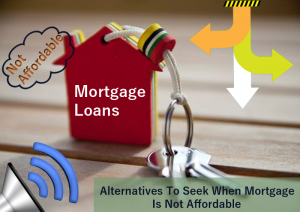 Now look at some of the options when you can’t afford your mortgage payment. Refinancing your mortgage comes to the aid in such case but it’s important that borrowers take up this alternative prior to missing on mortgage payments. You should also be ready for the paperwork. Filing for bankruptcy is generally very useful for stopping the home from getting into foreclosure process. However, it has its share of risks too and hence one should consult a good attorney. By taking this option it damages your credit to a substantial degree. You can go for a short sale- a sale where you sell off your property for a lesser value that is owned on your specific debt. Here the lender considers the sum as a complete payoff of your mortgage. This does not have a devastating effect as that of a foreclosure. A Deed in Lieu of Foreclosure is another option. Here you will voluntarily forfeit the property title to that of the servicers. This you will do with their consent. This is carried out in return for the cancellation of the debt balance. Here then you will lose your property but it does not have that damaging effect as that of foreclosure, on your credit score. There is also a rare option including negotiating a loan modification with your present lender. Also, there is another option wherein you sell your property or rent it. You might owe a certain amount and you can sell it at that value or more than it. However, this is not a good choice. As far as renting your property is concerned it may not be the best option. However, if it manages to make the process workable until you can pay your mortgage again then it may be considered. Scam artists are prevalent everywhere and they know when homeowner are falling short of their mortgage payments. They may sound as they are ever willing to help you but their intention is not so. Their main aim is to swindle you off your money. They mask themselves as foreclosure prevention specialist and charge an exorbitant amount just for doing some paperwork. Also they make the homeowners sign a deed. The deed will show that the homeowner can stay in the property as a renter. Later they can retain the property. So it’s very essential that one is careful of these scam artists. Dc Fawcett, who is an expert in Virtual Real Estate Investing, teaches aspiring entrepreneurs the essential elements of real estate investing.